Biwi wants to burn crackers this Diwali. She loves crackers. I'm a huge supporter of a No-Cracker Diwali and have been practicising the same for close to a decade now. Folks, kindly advise an amicable future course of action. 10. Crackers are very costly. 9. You are encouraging Child Labour by using crackers. 8. Most of the shops you buy these from, do not adhere to the Excise Dept guidelines. 7. Crackers release a lot of Ultra-violet and Infrared radiation, which are harmful to the eyes and the body parts. 6. 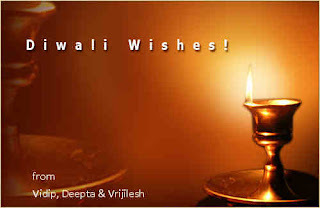 Diwali (Deepavali) is a festival of lights, not sound. Crackers can cause deafness. 5. Maximum number of Burn cases are reported in the Diwali season due to the improper use of crackers. 4. Humans might be able to protect themselves, but the crackers have a deep physical and mental impact upon animals. 3. Most crackers do not adhere to the Govt guidelines on Noise pollution and the sound of these crackers is above the permitted levels. In short, many are Illegal. 2. Levels of Air pollution, which are already high in India, reach astronomical levels on Diwali and can be very harmful to the human body. 1. Crackers and Fireworks are the single largest cause of respiratory diseases like Bronchial Asthma, Chronic Bronchitis and other Chronic Obstructive Pulmonary Diseases, and also a major cause of fright amongst the elderly which can lead to disastrous consequences on their health. So, hopefully, you would have a fun-filled, beautiful and cracker free Diwali. good ones! I'm linking this to my blog! Well, I still love fire crackers, but I stopped bursting them a few years ago for some of the reasons you mentioned. Unfortunately, I think you shouldn't enforce your principles on another person. I know it is a good one, but better to let a person realise it by themselves. (My brother stopped many years ago but never tried talking me into it.) What do you think? Anjuli.. Thats the same I did.. one box of phuljhadis for biwi n beta! Shru.. I'm surprised that there are places in ur house that u dint know. Well, how wud u, coz there is no water tank which has its tap turned off! Aarti.. Thanx and wish u the same! G3... hmm.. thats a good thought. maybe I should make amends!